Through GreenPath®, Delaware North's stewardship platform since 2001, we are committed to the care and protection of natural, cultural and historic resources. Our standards and best management practices contain values that guide decision making and help us achieve excellence. Environment. As the first U.S. hospitality company to register our environmental management system (EMS) to international ISO 14001 standards, we establish annual goals and implement improvements to minimize impacts from our operations. Asset Protection. We display, protect, and preserve historic artifacts and structures, and other treasures of national and international significance. We provide for appropriate visitor access and use of the assets that are under our care. Interpretation and Education. We embrace and share the remarkable stories of these Special Places through interpretation and education. We create an environment for associates and visitors to learn and appreciate them. Community Outreach. We are part of the communities in which we operate and work. Outreach efforts include the contribution of funds and services, as well as associate volunteerism. Healthy Food, Healthy Living. Through our Culinary WellbeingTM Program we are committed to serving "good food that is good for our guests". We remind guests and associates to be active and take advantage of healthy food options we offer. 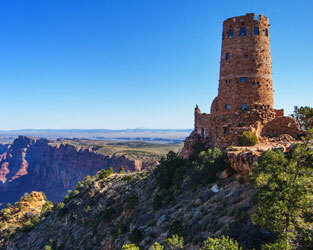 Want to make a positive impact on Grand Canyon National Park? Delaware North and the National Park Service are proud to host ongoing Litter Projects. 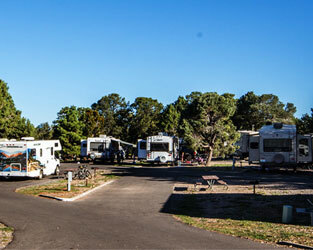 Interested guests can help address microtrash at the park at a pick-up project, facilitated by an employee of the National Park Service, and also learn more through interpretive programs and tours. Microtrash includes small bits of trash such as plastic wrappers, bottle caps, pieces of foil, cigarette butts, and much more. It poses a significant threat to wildlife at Grand Canyon and beyond. Pick-up supplies will be provided, and environmental stewards of all ages and abilities are welcome to participate! More information including sign-up details can be found on the National Park Service's website. Please consider the impacts on the environment regarding waste management. Remember to reduce waste, reuse materials when possible, and recycle. 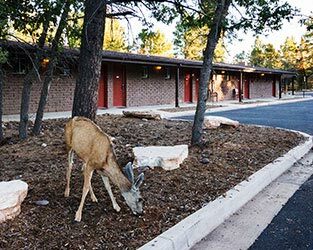 Partnering with National Park Service at Grand Canyon National Park, Delaware North at Grand Canyon manages waste using Single Stream Recycling. All trash and recycling is delivered to a sorting facility in nearby Prescott Valley, where machines and employees sort waste to maximize the benefits of recycling. No special recycling bins are required to manage waste at Grand Canyon! Help to reduce energy and water consumption by participating in the linen reuse program. Hang up towels for reuse. For a clean towel, place it on the floor. To reuse linens, place the water conservation card on the nightstand. For a clean set of sheets, place the water conservation card on the bed. Please remember to turn off lights, TVs, heating and air conditioning units, and equipment when you leave the room or when these items are not in use. Water is vital in so many ways. Reduce water consumption by shortening your showers, kindly turning off all faucets when they are not in use, and reporting any water leaks to the front desk staff. It is very important to drink plenty of water and stay well hydrated during your visit. To reduce the impacts from bottled water, Grand Canyon has banned bottled water from the Park. In support of this program, use a reusable water bottle and conveniently fill it at the numerous water filling stations located throughout the Park. Delaware North at the Grand Canyon is committed to providing sustainable food that is organically grown, locally grown, or otherwise produced in a way that minimizes the environmental and sociological impacts of its production or shipment. Get outside, hike and enjoy the trails of Grand Canyon. Please remain on all trails and walkways and remember to Hike Smart. Properly plan ahead, understand your hiking limitations, remain on all marked trails, and prepare by bringing plenty of food and water and always Leave No Trace. Never approach wild animals. It is dangerous (and illegal) to feed wild animals in any national park. Never leave pets, children or valuables in an unattended vehicle. Purchase and use environmentally friendly products whenever available and feasible. Ensure 70% of retail products sold are Made in USA. Dedicate 50% of the Desert View Trading Post retail space to culturally-tied-tribe specific handicrafts, jewelry and artwork. Ensure that at least 30% of foods purchased are local, sustainable, and/or organic. 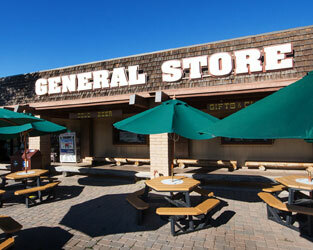 Purchase 90% of food ingredients within 190 miles of area. Purchase hormone and antibiotic free meat products. Provide 100% of coffee, tea, chocolate and hot chocolate from fair-trade or rainforest certified sources. Offer at least 40% of its beverage menu items without added sugar. 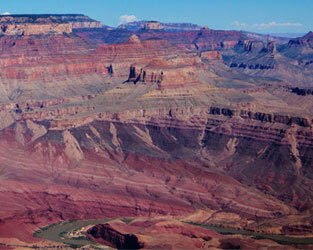 Achieve 40% waste diversion from the landfill by 2016, 65% diversion by 2020, and Zero Waste at the Grand Canyon by 2025. Minimize the generation of Hazardous Waste and Universal Waste. Reduce water use 40% by 2025. Reduce energy use 40% by 2025.